It is my goal to get rid of all the carpet in our house. If you wonder why, let me simply remind you that I have three boys! I have friends who are in the position where they can afford to put in all hardwood and continually upgrade their house. If I let it, the feeling of accomplishment that I get from my little improvements starts diminishing – like if I am not redoing things with the “best” or have them professional installed, then I shouldn’t be happy with what I have. However, when I feel this way, I try to actively pep talk myself out of it because I know it is not true. If I am happy with my little improvements, then that is enough! Yeah. It’s really bad. I’ve lost count of how many tubes of toothpaste have been ground into that carpet, or how many other *substances* have been tracked onto that carpet. But here’s the thing, I really want to put in tile, which means that I would need to rip up the old tile, get a tile cutter, uninstall the toilet, etc.. and I have just been putting it off because it just sounds like so much WORK! Then I had an epiphany (courtesy of my mom)! Why not settle for a temporary flooring solution? One that would be very inexpensive, but allow me to get rid of the carpet? And off I went to the internet to see what things could be found. I headed off to my local home repair store and was all set on getting peel and stick tiles. I figured they would be super easy and cheap. However, after talking to one of the sales guys there, I asked about removing peel-and-stick vinyl tiles (because I want to eventually replace the flooring with real tile) and he let me know that there would be a sticky, gluey mess. So with that bubble burst, I talked to him about my problem, and he suggested plain old vinyl flooring. Since my bathroom is so small, I was able to get a vinyl remnant for super cheap. 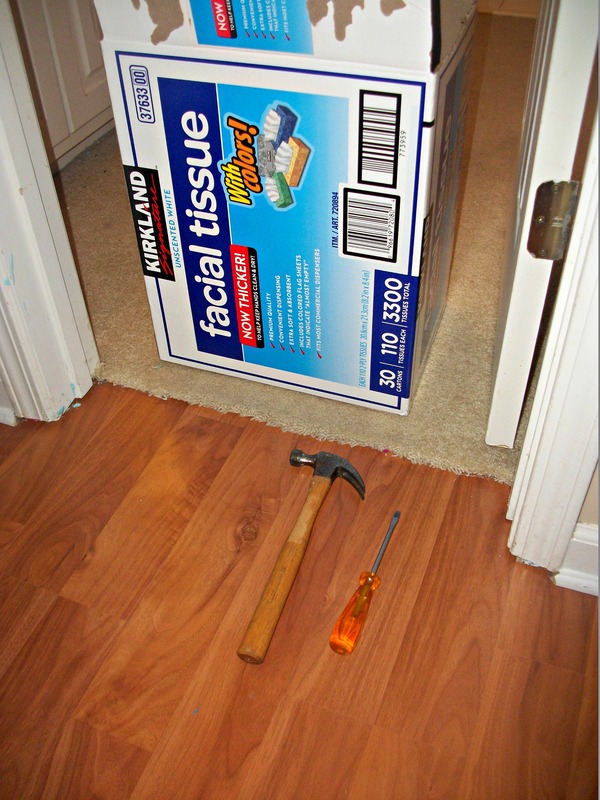 For removing the carpet, you’ll need a hammer, a screw driver, a pair of pliers, a broom, dustpan, and a box. (sorry everything didn’t make it into the picture!) If you are removing a large piece of carpet, you’ll also need either scissors or an exacto knife (knife is better). To pull up the carpet, use the claw of the hammer to pull up the carpet in the corner of your room. There is a tack strip (a thin piece of wood like a ruler with lots of SHARP nails in it) that hold the carpet down. If you are doing a large room, you may be tempted to roll up the entire carpet in one roll. This is a BAD IDEA! Carpet is extremely heavy. You can get it rolled up just fine, but then you have to be able to lift it!! I recommend cutting it into 4-5 feet widths before you roll it up. This is much easier to manage. Use your knife or scissors to make the cut at the width you want, then you can “rip” the carpet along that strip just like you can fabric. Once the carpet is gone, you will see the carpet padding. This is junk fill that is pressed and held together by a very thin net. It is stapled to the wood subflooring, so it can rip into pieces easily. I have found the best way to get it off in one piece to to roll it up. Now you will see your subfloor and you will be thinking: “Removing carpet is really easy! !” And you’ll be right! However, the next part can be really tedious if you are doing a large area, but for my small bathroom, it only took about 30 minutes. You will need to remove the tack strips from around the edges of the room and the staples that were holding the padding down. I use a combination of strategies to get the tack strips out. First of all – THEY ARE SHARP!!! I use the claw on my hammer to pry them off. If I can’t get a good angle on it with the hammer, I use my flat-head screw driver to wedge under and pry it up. Most likely, your tack strip will not come off cleanly in long pieces. That’s okay. Tip: When I am only redoing the floors in only one room, it can be helpful to hold onto one long tack strip to use to hold down the carpet where the transition is. For example: if you replace the carpet in your bedroom, but your hallway will still be carpeted, you may want to put a tack strip down where the carpet ends at the doorway. This is where you use your box. Those tack strips will cut right through a garbage bag, so the box solves that problem. Sweep up all your mess and put all of your tack strips in the box. Now to tackle the staples. Most of the time, the staples are easy to spot because they still have the carpet padding fibers stuck under them. Use your flat-head screw driver and pliers to get them out. Sweep everything and throw in your box and do one last check to make sure that you got all of the nails and staples out. Tip: It is my experience that if you are doing multiple rooms, you are better off planning the prep as a separate day before starting your installation. Crawling around prying out tack strips and staples takes a toll on your back and knees if you are doing it for several hours. Next, lay down your vinyl and use the box cutter to cut the laminate to fit your area. When buying your vinyl, keep in mind that having a geometric pattern can either help you or hurt you. Either it will help you cut straight lines or it will show you how crooked you cut it! The great thing about vinyl is it just sits on the floor. You don’t attach it in any way. It’s own weight holds it down as well and then the trim helps, too! Think about how easy that will be when I can finally install tile in 20 years! I normally don’t caulk around my trim, but I did in this case because it’s a bathroom, and I don’t want water seeping under the vinyl. Already, I can’t believe how many puddles of water I see on the floor that used to be soaked up by the carpet! So if you you want to get rid of your carpet, but you can’t afford something fancy yet, don’t worry about keeping up with the Jones’ and install some vinyl! I am so glad I did! I can’t imagine dealing with carpet in the kids bathroom–this is so much better! When you’re ready to tile, I’ll come out for a few days and we can do it together. Believe it or not, that sounds like a lot of fun to me! Johanna, you are always welcome to come out, even if we don’t tile!! !